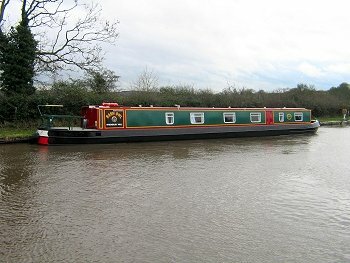 DESIGN: 70ft cruiser stern narrowboat suited for larger groups or for a luxury boat for 4 people. 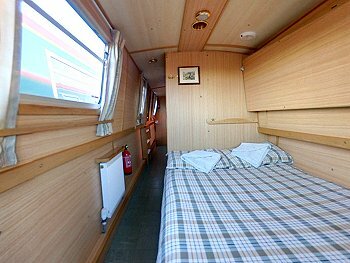 There is LED lighting throughout, a 4 speaker radio/cd, a front deck table, TV in saloon and bedroom, wider beds and large mirrors. Quiet water-cooled diesel engine with simple controls. Full radiator central heating. Hot and cold running water supplied from a 150 gallon water tank. Double filtered drinking water system. 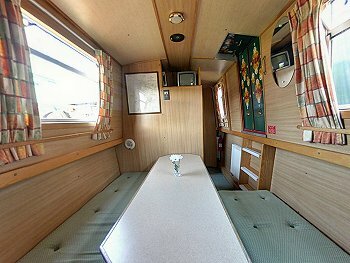 FEATURES: There is a security box on-board the Wagtail Class boats (except from the Gailey Marina). This boat is fitted with free WiFi - an explanation of how to use the WiFi will be supplied on-board your boat on arrival. 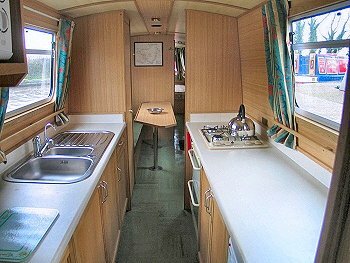 KITCHEN: Well-equipped galley with 4 burner gas cooker complete with grill and oven, refrigerator, sink and drainer, work surfaces and storage space. There is a toaster and microwave in the galley. 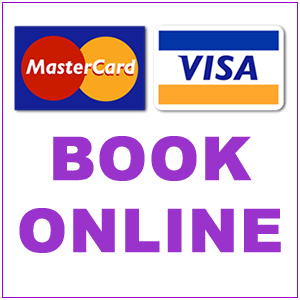 Sufficient saucepans, cooking utensils, crockery and cutlery etc. for the number of berths. BATHROOM: Two bathrooms, both with a wash basin, toilet, and a full-sized shower with bi-fold doors. There is also a 240v shaver socket. Large mirror.